I mentioned yesterday the Jan. 15 grenade attack on the office of Thai General Anupong, and how the incident underscores tensions within the Thai Army. Rumours of another coup have been spreading like wildfire after 22 armoured vehicles rolled on to the streets of Bangkok on Monday night. 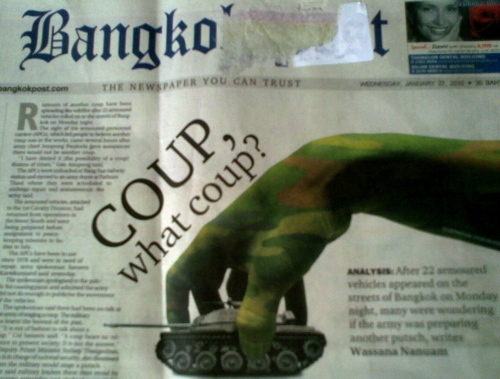 The sight of the armoured personnel carriers (APCs), which led people to believe another coup was in the works, came several hours after army chief Anupong Paojinda gave assurances there would not be another coup. “I have denied it [the possibility of a coup] dozens of times,” Gen Anupong said. I have no viewpoint to add on the issue, but I’m sharing the image because Thailand watchers might like to see how prominent the story is in today’s edition of the print paper.